Fine and rare Louis XVI ormoulu, glass and Cararra marble pendule-cage by Sotiau with superb original gilding. The clock rests on a beaded stepped Cararra marble base with indented corners mounted with ormoulu matte-gilded scrolls on highly burnished plain grounds. The glazed ormoulu cage enclosing the movement is raised on an ormoulu plinth with the central frieze decorated with a relief of putti representing the Four Seasons. The sides are decorated with matte gilded scrolls centered on roses and cornflowers, Marie-Antoinette’s favorite flowers, also on burnished back-plates; the rear with a panel of vertically striated “textile” ormoulu. The clock dial has a ribbon mount above and a mount of a female mask framed by oak boughs below. A balustrade sits on top composed of 78 separately cast balusters. 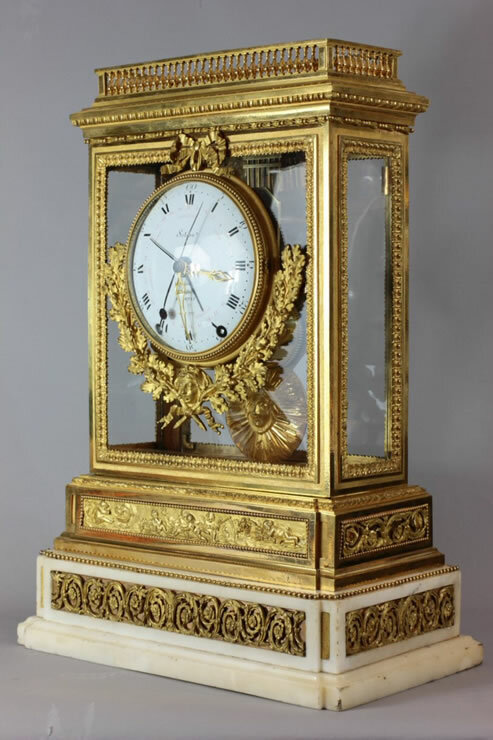 There are two nearly identical Sotiau clocks at Versailles; one in Marie-Antoinette’s Cabinet doré, and the other in the petite salle à manger in the Petit Trianon. The second clock is thought to have been in the Council Chamber of Louis XVI at Saint-Cloud. Both Versailles clocks have less complicated movements, telling only the time.